Apart from getting the ACA certificate, you can choose to take an additional online course called the Adjuster Bootcamp. This course will educate you regarding the industry and job opportunities that will be available once you receive your Insurance Adjuster license. In addition, The Adjuster Bootcamp course includes video lessons to learn valuable adjuster tools. 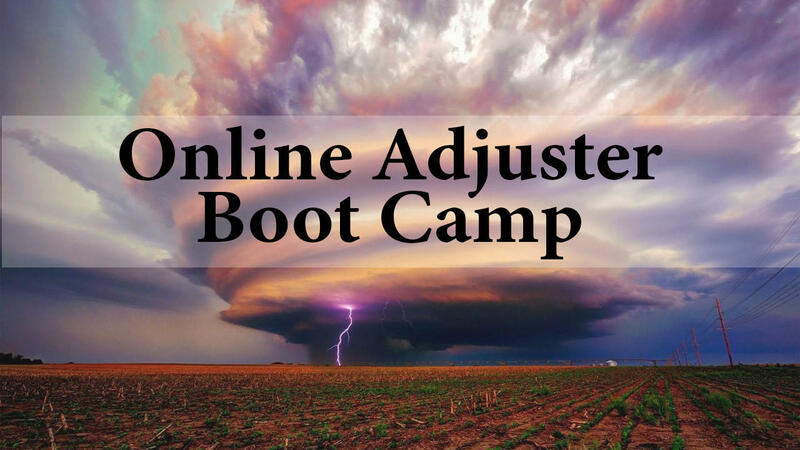 The Adjuster Bootcamp course includes Xactimate training online which is the number one software in the country used by adjusters to evaluate damaged property and write estimates. Get Trained Now For An Insurance Adjuster Career! Insurance claims, whether from bad weather or daily disasters are recession proof and cannot be outsourced because someone must actually go out to the property and do an on-site inspection. After a natural disaster like this past years tornado swarms, Hurricane Sandy and blizzards, an adjuster can earn $800 to $1,000 a day investigating these claims with the proper training. After Hurricane Sandy many of our new Alumni, with no prior experience, earned $25,000 to $45,000 in just 6 - 8 weeks! And while big storms don't come around but a couple of times a year, a daily adjuster can reasonably earn $600 - $3,000 a week. JEL’s Boot Camp will prepare you to investigate and process these claims from start to finish, including using the estimating software Xactimate, and be on your way to a new and exciting career as a property and catastrophic adjuster. This module covers the types of claims you may encounter and the different types of adjusters. You will learn how to work with the insured and the adjusting firm and how you get paid. You will also learn how to interact with various legal entities and contractors as well as how building codes come in to play. Finally. you will learn the unique language of adjusting. Adjusters need to know some basic geometry and math skills in order to effectively measure a claim. You will have some practical skills drills to help you learn this. As an adjuster you need to know basic construction from the roof down to the foundation and how we handle that for a claim. It is not always the same as what can be done as a contractor. This module will touch on all aspects of the construction of a house. You will need some basic equipment to get started in the field, this module will cover what is needed. Also, we will cover ladder safety and other safety aspects of the job. You will need to understand the property insurance contracts you are adjusting the claim for. While this is in the licensing material you may have used it’s important to review it. In this module you will be taken from start to finish through the entire claims process. Many previous students have taken this to the field with them to make sure they have covered all their bases when doing a claim. Here we will cover how to organize your work, deal with various damages on your estimate, handle challenges with the insured and your firm and managing your workflow so you can get paid efficiently. We will discuss many areas where you can get into trouble in this profession and how to avoid it. We will also go into detail on how to build your resume as a new adjuster and how to find work and get your foot in the door. Our Xactimate training will take you through how to do an entire estimate including sketching and adding damages. Who Benefits From JEL’s Boot Camp? Anyone seeking a new career such as retirees can benefit taking our Boot Camp course. You can do Daily claims in your local area or work as a storm chaser and go where the weather leads you around the country. Storm chasers or CAT adjusters typically can make well over $100,000 a year and many only work 7 or 8 months a year. It can be a challenging and exciting career. Contractors – Many contractors take the Boot Camp to increase their bottom line. Being able to advertise as a trained adjustor provides the opportunity to liaison with insurance company adjustors. They not only gain more confidence and business from property owners, but are also able to increase their own estimates by including more of what the insurance carriers will approve in a language that the carriers understand. Real Estate Investors – The training we provide in Boot Camp also benefits the Investors when they evaluate properties they are considering purchasing for rehabbing to flip for investments. By learning how to utilize the estimating software Xactimate they have a powerful tool for presenting a professional document to gain the funds needed. They can also go run a storm as an adjuster and earn the seed money to invest in more properties if desired. • JEL Publishing has been around since 1986 and has trained over 100,000 people in the insurance industry in licensing, sales, continuing education and adjusting. We know training. • We are a three generation family business with over 100 years of accumulated knowledge. When you become one of our students you become family. You get our personal emails and cell phone numbers. The help doesn’t stop when the class is over. • We take a holistic approach to training – by being professional trainers who became adjusters (our lead trainer has worked over 500 claims through Hurricanes Katrina, Gustave, and daily claims) we understand all learning styles and design our classes accordingly. You will never be left behind. Since 2006 we have taught the Boot Camp in a 5-Day format. But with the economy the way it is and the cost of travel and hotel and food, many of the people wanting to take the class found it too difficult. Either it was hard to take off a week from what they were currently doing or the cost was too high. We came up with this solution. We put on video much of what we do in the class and then put that online. Initally we also offered 2 days of classroom at the end as an optional addition to the course but the students going through the online course felt they had gained so knowledge much that the classroom was not needed. This is a small representation of comments our students gave along with permission to use on our website. Originals with full names are in our office. “If you are serious about becoming an independent insurance adjuster, attend the JEL Bootcamp, where they are serious about helping you succeed with your future as a knowledgeable, effective and respectable new adjuster.” Joe V., St. Petersburg, Fl. “Very well planned and executed course.” Philip O. Gretna, LA. “Complete hands on CAT adjusting experience.” Gabe A. Denver, CO.
“JEL gave me the training and the knowledge to where I feel I could walk out the final day of Bootcamp and adjust a claim.” Jonathan H. Venice, FL. “Training was very well organized.” Teresa W. Fort Peirce, FL. “The instructors go the extra mile to help all of the students. Very Personal.” Leah W. Wheaton, MD. “You get out of the class what you put in. Time and desire is all that is needed.” Kathleen C. Baltimore, MD. “Best in the industry. Most easy way to change careers from 25k to over 100k in very short period.” Gamini K. St. Petersburg Beach, FL. “Very informative, but you want to want it.” Dennis I. Stuart, FL. “This is the one people! All the tools you need to get your career started!” Jim G. Lutz, FL. “Anyone who is starting out as an adjuster needs to come to this class. It covers the A to Z of adjusting & really prepares you for the ‘real world of adjusting’”. Jeff P. Duluth, GA.
“Perfect way to learn about being a property adjuster.” Doug H. Mt. Dora, FL. “Good training opens doors.” Kisha J. Florence, SC. “Adjuster Bootcamp was a great preparation for new adjusters!” Michael A. Beachwood, OH. “You will definitely gain strength in sketch & Xactimate when the course is over.” David A. Hartville, OH. “This class is for serious professionals wanting to excel in their adjusting career and to gain real world knowledge regarding adjusting CAT claims, etc.” Kevin H. St. Petersburg, FL. “Very informative comprehensive course to get you heading on the right track to becoming an adjuster.” Neal H. Holly Hill, SC. “Even without computer knowledge they were able to keep me working with the rest of the class.” Vince G. High Springs, FL. It’s no wonder you are not required to take a state test after completing this Bootcamp, JEL teaches you more!” Bob G. Tampa, FL. “Being new to the industry I needed some help, but the information that you learn @JEL went above my expectations.” Steven G. Naples, FL. “I learned a lot, very valuable class that will enable me to start my career!” Brian F. Cincinnati, OH. “In my opinion, I think this was the best Xactimate class that I found online and attended. This class filled my head with the knowledge I needed to hit the ground and start running as an adjuster. The instructors were excellent. Thanks Linda and Casey.” Jerold W. Orlando, FL. “Great teacher and assistant.” Dave P. Odessa, FL. “JEL Adjusting- Little known course where positive, skilled, educated people are grown.” Dale C. Casselberry, FL. “A hands-on practical course that provides a rich overview of the claims adjusting process. I highly recommend it. Roy M. Naples, FL. “Take the time to invest in this course, it is worth the time and money!” Jared N. Wilmar, AR. “Bootcamp on steroids!” Robert K. Harrisburg, NC. “I walked in with very little understanding or experience, but completing the class I feel confident I could go out and adjust a property accurately with the tools I have learned in class.” Todd J. Myakka City, FL. “Even with the experience I had coming into class I learned new skills that I will put into good use.” Lou J. Seminole, FL. “Instructors are very knowledgeable about all aspects of Xactimate. Every question answered.” Jeffery H. Rome, GA.
“Awesome learning the ever vastness of Xactimate.” Max T. Decatur, IL. “Provided me that moment of clarity!” Amelio W. Pensacola, FL. “A very enlightening experience should have done this 25 years ago.” William W. Spring Hill, FL. “This class gives anyone considering adjusting as a career an immediate prevalent understanding of what is needed to be successful and the proper tools to be successful.” Brian O. Cape Coral, FL. “This is a professional university quality class that uses the mix of experience and teaching. Just great!” Jonathan P. Bloomington, IN. “The class lives up to its name. A lot of information, well presented and thoroughly explained.” Nico, P.
“Teacher knows what she is talking about. Lots of experience. She does a great job!” James R. Altha, FL. “This course will give an adjuster a great advantage in this very competitive field!” Damon R. Maitland, FL. “Gave a great deal of useful information.” Bernard S. C.C. Hills, IL. “I now feel confident to have a company throw me into a storm and come out successful!” Dalton S. Boca Raton, FL. “Very informative, A must for new adjusters!” Rich S. Port Orange, FL. “Fun, but informative!” Susan S. LaGrange, GA.
“Life changing. Informative. Eye-opener.” Jonathan S. Ft. Walton Beach, FL. “The course was very comprehensive and the teachers were a joy to work with!” William L. Port St. Lucie, FL. Or you can get started today on a new, exciting career! After licensing, the Boot Camp will teach you the basic skills needed to be successful in the Adjusting Industry.